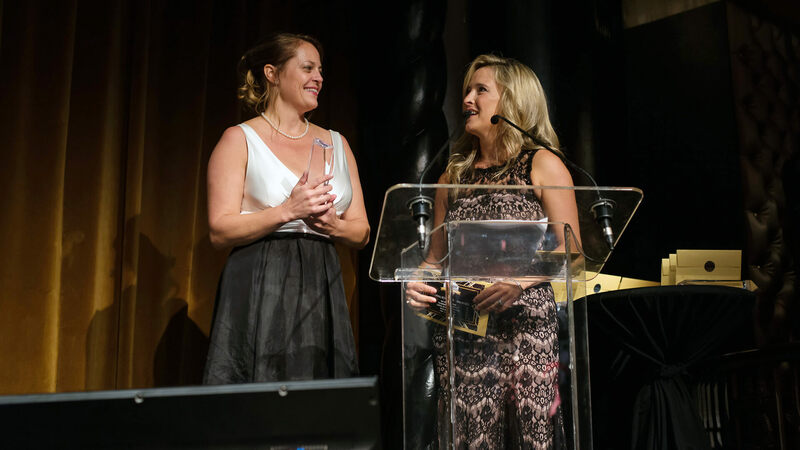 Kimberly Kuntz and Kate Sikora of Noble Studios accept Landy Award for Best SEO Initiative for Small Business. TahoeSouth.com, a travel site owned by the Lake Tahoe Visitors Authority, turned to Noble Studios to help grow its web traffic beyond the site’s usual user patterns based on weather trends. Not only did Noble Studios help drive traffic and increase site conversions — the agency’s work earned Noble Studios the Landy Award for Best SEO Initiative for Small Business. Hallert says he and his team — Kate Sikora, Kimberly Kuntz, Andy Walden, and Somer Athari — aimed to create more awareness around the travel site through traffic and content promotion. “We worked really closely with them to take on a new approach to blogging and content creation that involved talking about special events more frequently and having more robust and detailed content around special events,” says Hallert. In addition to putting a stronger focus on special events content, Noble Studios worked with the client to create evergreen pages and develop a content strategy around prominent seasonal attractions within the Tahoe South region. The agency also introduced a structured data model for the site and integrated Google Maps on each page of the website, a move that Noble Studios says increased conversions significantly. Over the course of a year, TahoeSouth.com saw a number of traffic increases with particularly high returns on mobile. Mobile site traffic increased 134 percent, and mobile page views were up 102 percent. The mobile site saw an increase in organic searches by 345 percent — along with a 224-percent increase in referrals via social media. The desktop website also saw gains, with traffic up 14 percent and page views up 32 percent. Organic searches for the desktop site rose 38 percent, and bounce rate dropped by 32 percent. Hallert says the campaign reminded him how important it is not only to create new content, but to understand where the search demand is before writing the content. Tags:Channel: SEMSearch Engine Land AwardsSEM IndustrySEM Industry: Awards.